High Temperature Food Grade Grease | Non Toxic Grease | Superior Industries, Inc.
Food Grade lubricants require the utmost of a grease—the highest quality non-toxic ingredients, unobtrusive taste and smell, and the ability to withstand higher than average temperatures and workload. You can find all of these qualities and more in FG-1200, Superior Industries’ heavy duty non-toxic food grade grease. FG-1200 can endure high temperatures up to 1000°F (540°C) as well as shock loading, regular water washout, and extreme pressures. This grease complies with FDA and USDA standards for incidental food contact, the highest possible grade. Ideal for food and consumer product production and packaging plants. 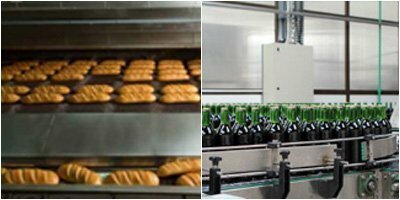 You can apply FG-1200 to machinery in food, cosmetics, and pharmaceutical processing environments, including packing plants, bakeries, wineries, and food packaging manufacturing, where this grease excels in extreme operating conditions. This grease functions as a multi-purpose lubricant to maintain conveyors, ovens, hinges, linkages, chains, and roller bearings. Designed specifically as afood grade high temperature synthetic grease, FG-1200 stands out in a new generation of high performance synthetic lubricants formulated to meet the stringent requirements of the food, cosmetic and pharmaceutical industries. 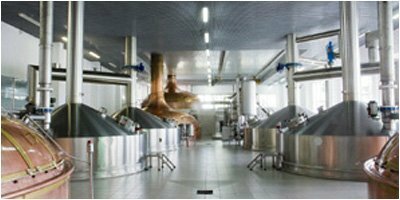 Its ability to withstand extreme heat makes FG-1200 ahot commodity, especially for maintaining ovens, canneries, and breweries. This non-toxic food grade grease operates effectively at continuous temperatures between 500°F and 800°F (260- 425°C), with the ability to withstand intermittenttemperature spikes up to 1000°F (540°C). 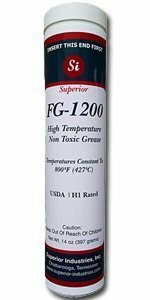 FG-1200 incorporates a high-quality synthetic hydrocarbon base oil which assures its thermal stability in the presence of extreme heat. With no dropping point, this non-toxic heavy-duty lubricant will not melt out of valuable machinery or turn hard or brittle. FG-1200’s reliability minimizes contact with food or cosmetic products (as it will not sling out)and keeps it bonded to critical moving parts. 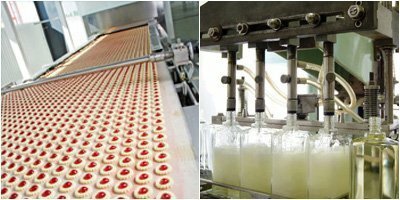 Manufacturing and packing plants have proven its durability as a lubricant for oven conveyor bearings, roller bearings, chains, slides, cams, journals, hinges, and latches at elevated temperatures in a wide variety of harsh conditions, including sugar refineries and bottling plants. This non-toxic food grade grease complies with federal regulations for incidental food contact, specifically FDA regulation Title 21 and CFR 178.3570. FG-1200 also carries a USDA rating of H-1, the highest safety classification given to food lubricants by the USDA. The secret to FG-1200’s success is found in its invisibility. This grease is water clear and has no discernable flavor or odor. Furthermore, FG-1200 contains no dyes, stains, or impurities that could disqualify it from food plant use. 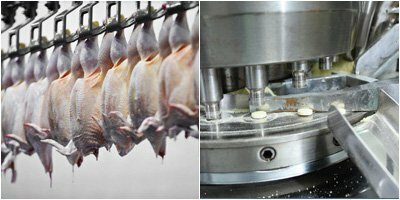 In industries where preventing and fighting the growth of bacteria is a top priority—such as meat, cheese, and seafood processing— FG-1200 stands out as reliable lubricant that resists bacterial growth—no hiding or fostering microbes. Changing processes and standards in the pharmaceutical, cosmetic, and food industries have increased the demands on lubricant service life performance. As trends continue to extend intervals between lubrication, more durable food grade greases are required. A synthetically thickened NLGI Grade II grease, FG-1200 stands up to extreme pressures, continuous use, and shock loadingwithremarkably long-lasting viscosity. This lubricant will not pound out or sling off despite severe operating conditions such as constant vibrations, shear, or high pressures combined with high temperatures. The reliable viscosity and tenacity of FG-1200 makes this an ideal choice for pharmaceutical applications, bottling, and conveyor systems. FG-1200’s endurance affects more than just the length of its service life. This high temperature food grade grease demonstrates excellent resistance to water washout and detergents, an ever-present reality in meat and seafood processing. It also resists breakdown due to exposure to acids, caustics, cleaners, and salt spray. FG-1200 maintains its high quality, heavy duty viscosity throughout food and pharmaceutical processes— including washouts, sanitation, and disinfecting— and preserves metal machinery from fast-forming rust and corrosion.